Her face and chest are covered in a light ivory silk, I used black cotton for her hair and stitched super simple features. Now I’m adding a scrap of lace because it’s lovely and will also cover some edges and seams I’d like to conceal. 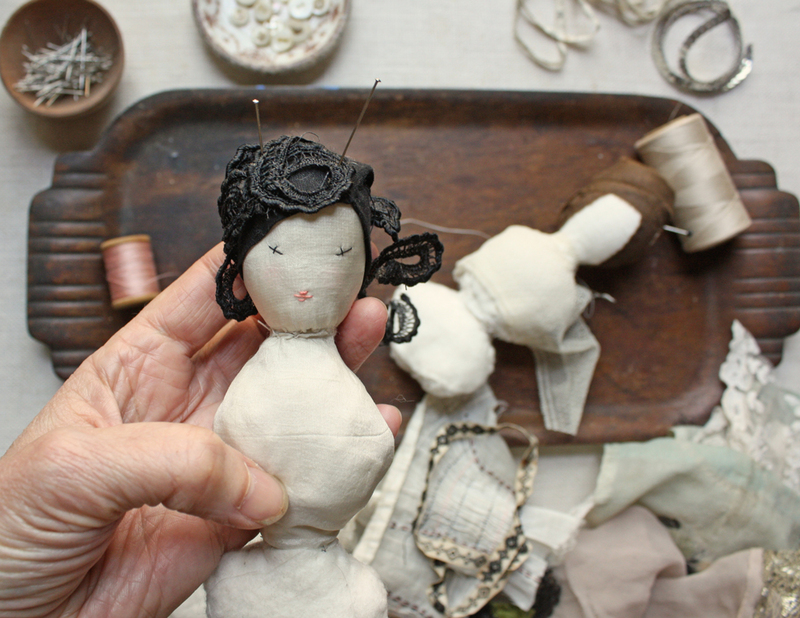 Back to mrs. brown hair – I wound the long strip of cotton for the hair around her head and pinned it – just to get out out of my way for now – but I think I like it and might stitch it in place- happy accident. 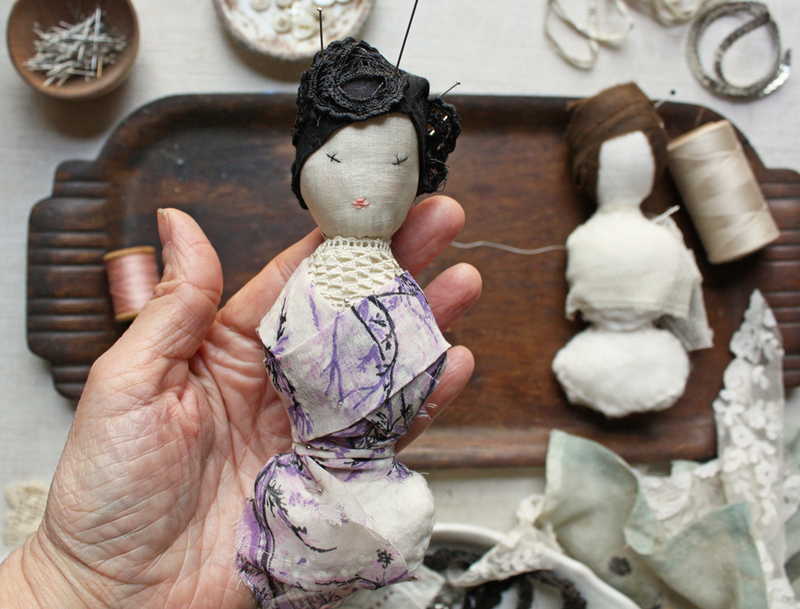 For the beginning of her dress I’m stitching a little piece of lace over her neck and chest – just the front. I’ll trim off the extra. 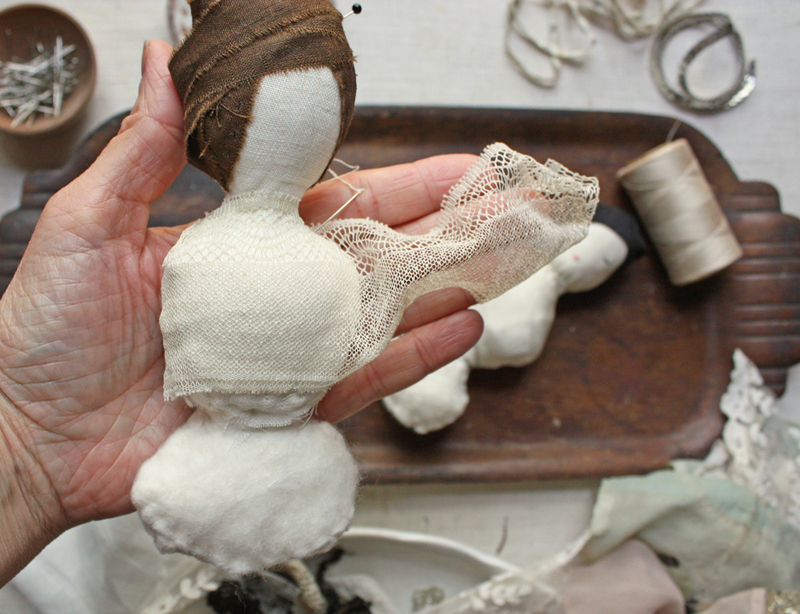 I did something similar for the other doll – a bit of lace at her neck and now I’m experimenting with folded strips to make a dress – just playing and pinning – to see what might work. She’s fancy. I’ll be back next week with part 2 – making arms and legs, finishing the clothes and details. 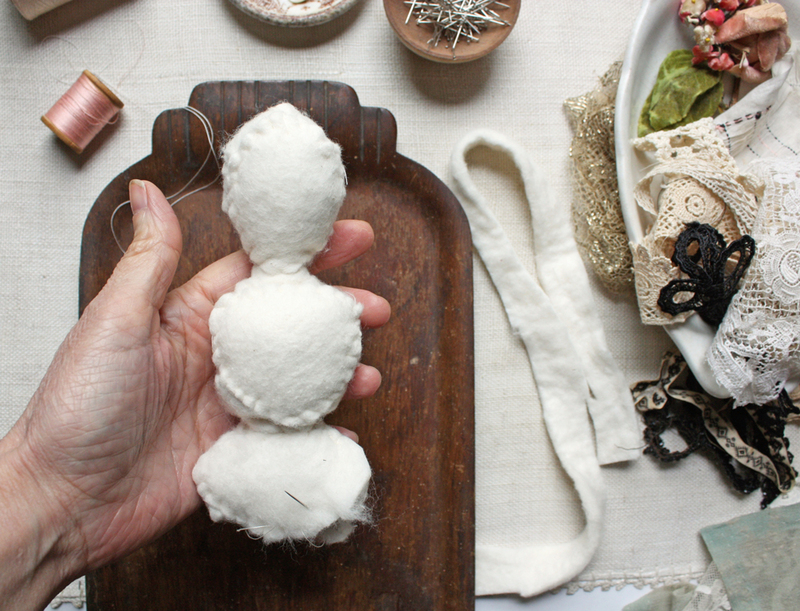 If you experiment with this I’d love to see – you can email photos to info at ann wood handmade dot com or use #improvisationaldoll on instagram etc. I really love these handmade things you make. your ideas are so amazing, I love the mice and other animals hand sewing has never been one of my better things I’ve been able to do. I love your small dolls I have a dollhouse not completed yet but that would add to all the other handmade items I have made for my house. I love your patterns hope to purchase some real soon. May have to try this one after a while. It looks fun and creative. In the meanwhile, working on decopauge, off and on. Look forward to seeing the next step. Great idea. I must try this method. Interesting to see you are working on 2 at a time. I also like to have several going at a time. So far have made 5 little dolls, 10 trees various sizes and 5 mice, but can only find 4 1 escaped hope he comes home soon the others all miss him. Wonderful! Thanks for sharing and reminding me of the fun I had making mine at Squam 🙂 Need to try it again. Thank you Ann……. so fun to see this process! You are a lovely teacher. This is so great – I’m an artist who mostly paints and draws and the idea of creating in 3-d is intimidating. Your tutorial really demystifies the process, and I love how “freeform” it is. Thank you! Thanks for sharing your talent. I love looking at your work and cannot wait for the next news letter !! Even though I don’t have the time to make these I love being inspired by them !! Sending you warm hugs from South Africa . I needed this! Thank u Ann…. It’s the May Day bank holiday in UK, a three day weekend and now your lovely gift to us all. 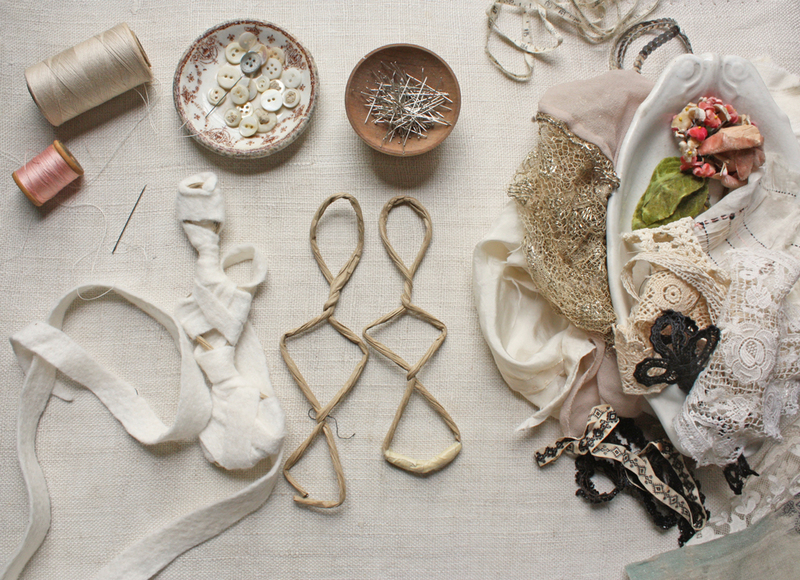 I can’t resist collecting scraps of nice fabric, ribbons and lace, which will be good for the doll. My owl Strix from your pattern sits on my table and also inspires me. Thank you. 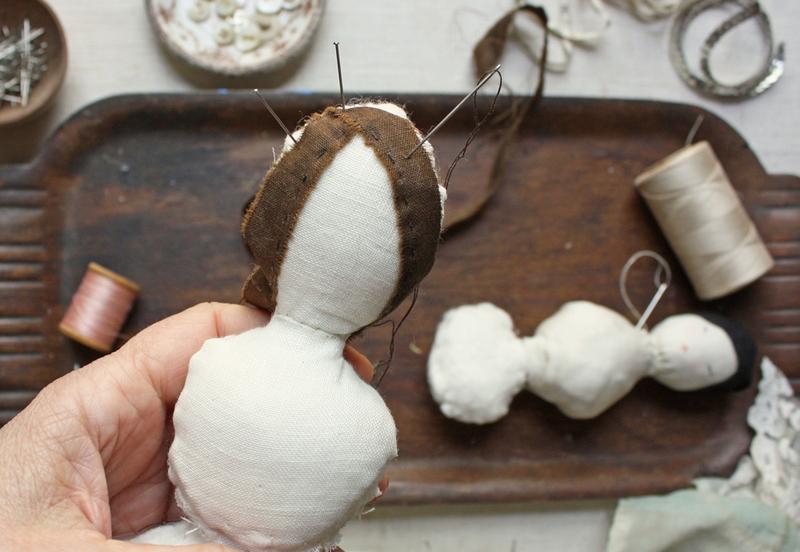 I’m so HAPPY HAPPY HAPPY to get these instructions & pictures of how to make a doll, & I LOVE LOVE LOVE what you have done, I’m going to to work on getting the supplies together & cant wait to get started. 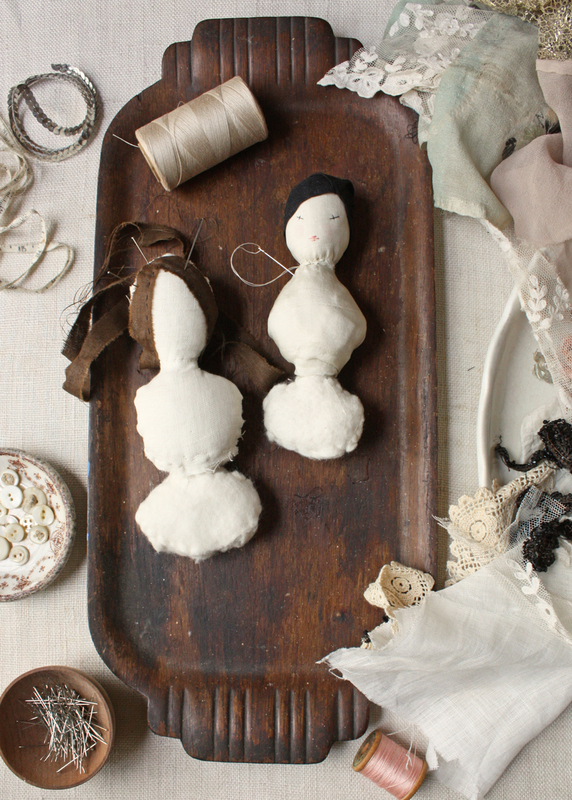 Its always been on my mind to make a doll & I’m sure I can do it now! Thank you so so much! This is a wonderful photo tutorial of the creative process; easy to follow and unique in result. Thank you for sharing! I love reading about your process, Ann! Thank you so much for sharing. It’s so interesting to see how other artists work, think, play and make mistakes….. I look forward to your newsletter each week. Thanks again for sharing! Merci de partager vos improvisations!!! !